Fly amanita (Amanita muscaria) is the cutest mushroom with its cheery red cap and jaunty white spots. A long time ago I bought hand-lathed mushroom yard stakes from a neighbor in England, but sadly lost them many moves ago. I don't have access to a lathe, and I was enchanted when I saw Twig and Toadstool's mushroom seat project from the 70s here on Pinterest. They use old wooden salad bowls and logs. I love bringing a bit of European charm to my suburban Ohio home. 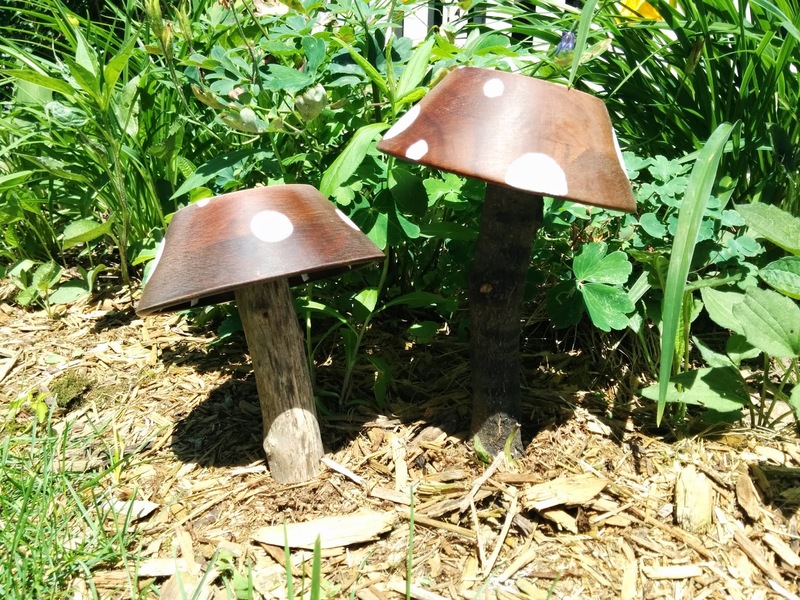 As I don't have any little ones about, I decided to recreate my lost mushroom stakes, rather than make seating. The process is basically the same, but I use smaller "stems" and add a screw to the bottom so they will stand up on their own. 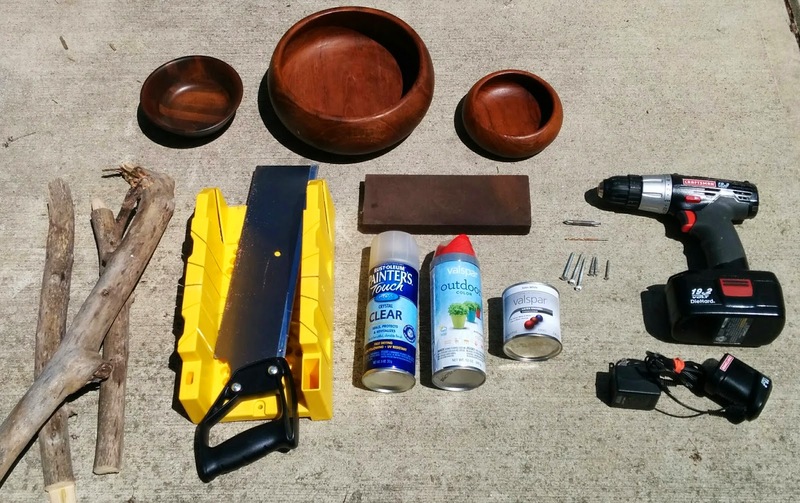 I plan to experiment with other thrifted materials in the future since wooden bowls are hard to find. 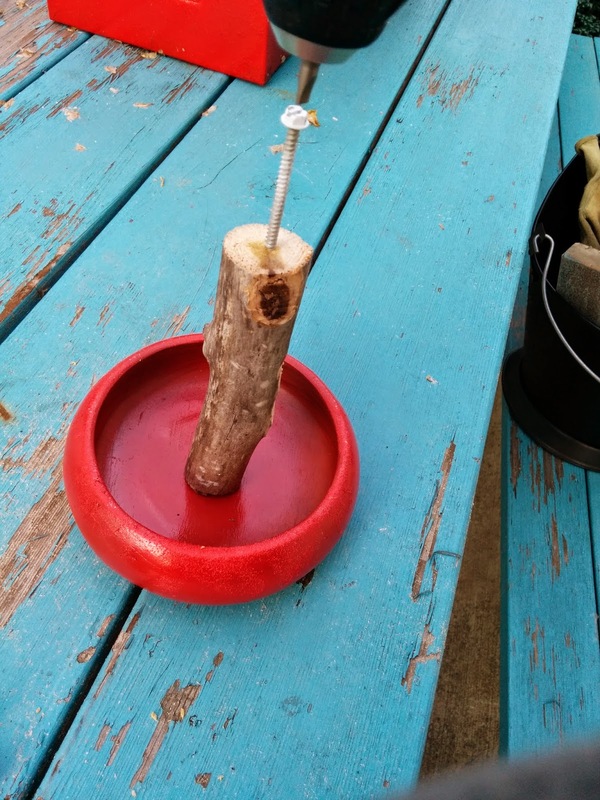 I think plastic bowls and cups, glass or ceramic bowls with candlestick or vase stems (using epoxy instead of screws), or anything vaguely mushroom-y would work. I'm trying to think of a way to make some that light up--maybe with an overturned vase for the stem. Not feeling crafty or need a couple of bowls? I have toadstools and bowls for sale in my Etsy shop here. If you want to paint your branch "stems" white, do so first and allow to dry. I didn't do this first and the natural wood color just got lost in the grass and mulch. Wash your bowls with warm water and soap and allow to dry. Remove any stickers and residue. Sand bowls lightly and wipe with lint free cloth. I set my bowls on wooden stakes so the bottoms wouldn't touch the drop cloth. 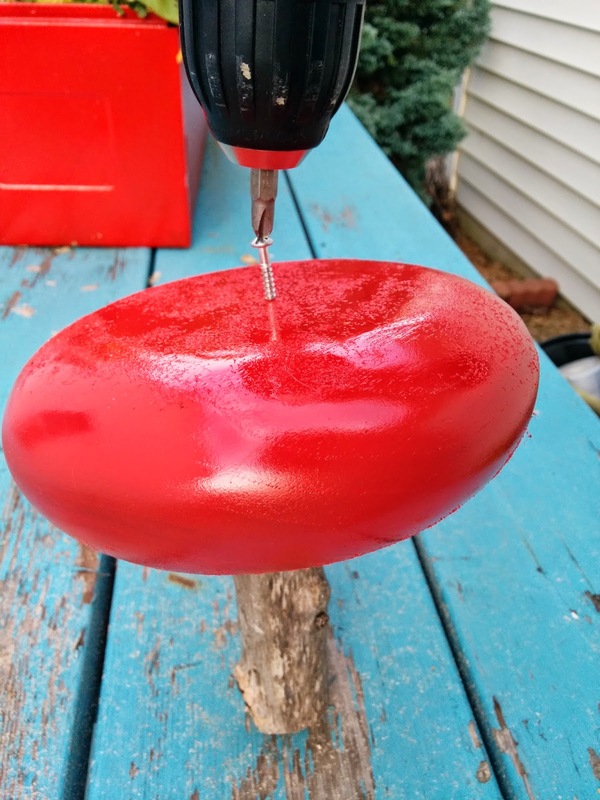 Apply several light coats of red paint, allowing to dry between coats. I used Valspar's outdoor paint for added durability. It took a long time to dry and remained tacky to the touch for longer than I expected, so I'm not completely happy with this product. Using a drill bit slightly narrower than your screws, drill pilot holes about 1/2" deep in each end of your stems. Drill a hole all the way through each bowl in the bottom center. Using the 1" screws, attach the bowls to the stems. Using the longer screws, drill them about one inch into the base of the stem. 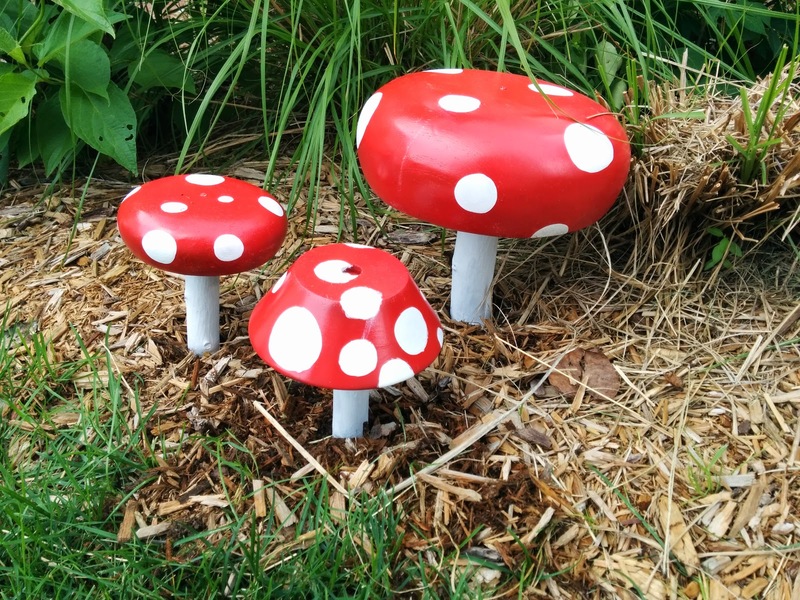 This will push into the dirt and allow your mushrooms to stand up on their own. Paint on white spots-try this on some other surface first to make sure you have the technique down. 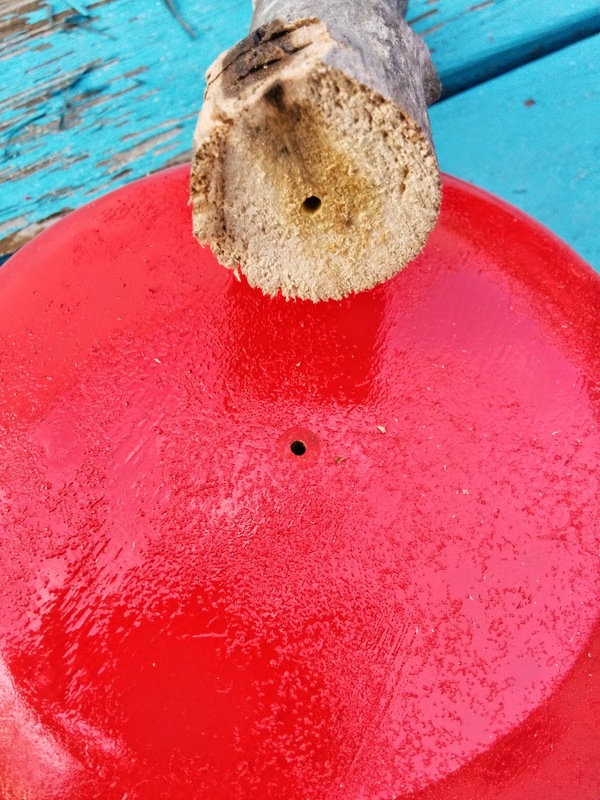 I dip my brush in the can of paint about halfway up the bristles, wipe off one side of the bristles against the edge of the can, put the side with paint on it against mushroom surface, apply slight pressure, and turn it 360 degrees. Another option is to use a sponge stamp for textured circles. 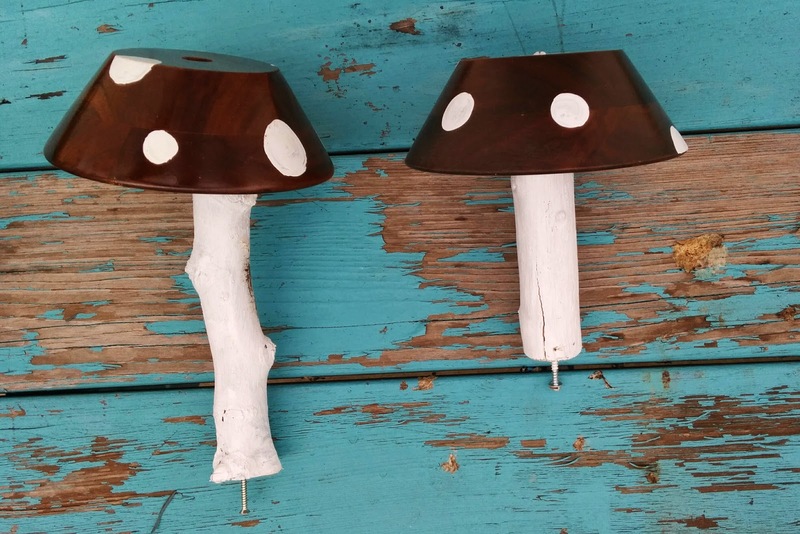 You can make one by cutting a circle out of a kitchen sponge, getting it wet and thoroughly wringing it out, then dipping one side in the paint and lightly applying to your mushroom. After the spots have dried, apply a few thin layers of spray on clear coat to protect them from the weather. Stake in your favorite spot and enjoy! I left some of my bowls the natural wood like the hand turned toadstools I used to have, and am quite happy with the results of those. I painted white ribs underneath those just for fun, and later decided to paint the stems white. These look fine alone but I like a grouping of two or more with a little garden gnome or animal statue underneath, or even Smurfs for some 80s nostalgia. The mushrooms shown above, and some plain bowls, are available in my shop at https://www.etsy.com/shop/susiequte42.